As she leads the way to her bright sewing room, Lydia Ferrigan announces with a grin and a certain amount of pride that she probably has the smallest fabric stash of any quilter she knows. Her eyes sparkle as she suggests a photo be taken to prove her point. Growing up in Boston, then moving to the upper peninsula of Michigan, on to Ohio, and finally to Woodridge in 1987, she began to quilt ten years ago after another teacher’s aide at Downers Grove North High School, where she was working, introduced her to the idea. Early on, she was inspired by the “Quilt in a Day” expert, Eleanor Burns, and her ability to quickly lead a newbie toward a completed quilt. It was a short hop from there to joining RQG in 2007. Lydia is a member of three bees – Empty Spools, Quarter Inch Queens, and Bee-Havers – and counts on her bee buddies to help her out when she’s stymied on a project. She has co-chaired Philanthropy with Heidi Enright and Special Events with Linda Yokelson. 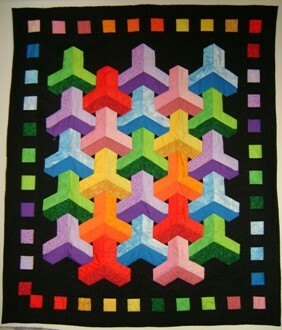 One of her favorite techniques is three dimensional machine applique, which she uses in small wall hangings, sometimes making a set of four of the same pattern, each in colors to match a season of the year. She points out quickly that she loves the immediate gratification she gets from machine quilting – yes, she has a long-arm – and avoids handwork such as applique or hand-quilting at all costs. Mastering free form quilting is a current goal she is working toward.She especially enjoys working with batiks and visits the website www.quiltingboard.com often.